So Tim Burton’s “Alice in Wonderland” opened in London, and Chris Tookey of the Daily Mail says it’s long on visuals and short on story. Tookey’s take — get it? — is that Linda Wooverton diluted the project with her attempt to write a sequel to Lewis Carroll’s “Alice” books instead of re-telling the original stories — or, at least, one of them. 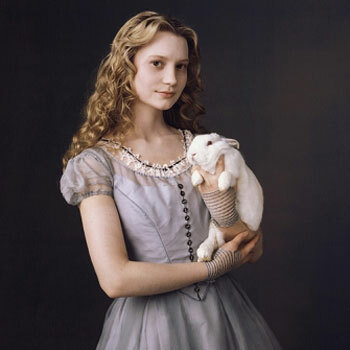 So everybody — including Mia Wasikowska as Alice, Johnny Depp as the Mad Hatter, and Anne Hathaway as the White Queen — looks great, but has nowhere to go. “The story becomes a very different beast from the ones Lewis Carroll created,” Tookey writes. “It’s a tale of feminist empowerment, with an entrepreneurial, pro-capitalist ending that is unlikely to endear it to readers of the Guardian.” In other words, it’s a 3-D version of the health-care summit. According to Tookey’s account, a central issue in this tale is that the Red Queen has enlisted the Jabberwock, the Jubjub Bird and the Bandersnatch as enforcers in her reign of terror. In Carroll’s dream within a novel, of course, these were characters in a poem, not “real” creatures. Alice reads about them in a looking-glass book, which means a book in which the print is backwards so that one has to hold it up to a mirror in order to read it. 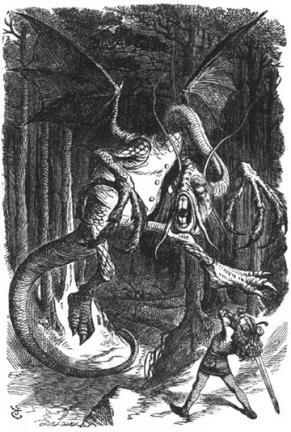 “Jabberwocky,” incidentally, is a particular challenge to translators who want to make “Alice” available to the non-English-speaking world. There’s a French version that begins: Il brilque: les toves lubricilleux / Se gyrent en vrillant dans le guave …. A German translation begins: Es Brillig war. Die schlichte Toven / Wirrten und wimmelten in Waben …. Chris Tookey’s review of Tim Burton’s film is at THIS LINK.